Disney Springs® has it all; exciting entertainment, signature dining and unique shopping. Looking for somewhere fun to spend an afternoon or evening at the Walt Disney World® Resort? Head to Disney Springs! The expansive venue includes more than 150 activities for families, couples and friends alike. Park admission is not required for Disney Springs®, making it the perfect place to celebrate your first night or even last morning of vacation if you don't have a park ticket for that day. It’s also a place you'll want to visit all the days in between. Disney Springs® is a great place for relaxing during a busy afternoon in the parks or finding a souvenir for that person back home who’s usually hard to shop for. Whether you’re visiting to shop, dine or play, we know you’ll have a good time at Disney Springs®. Restaurants within Disney Springs® offer all sorts of experiences, ranging from fine dining at The BOATHOUSE to themed dining at T-REX. Don’t have time to sit down? Grab a quick bite from the food trucks or quick service locations throughout. Even the pickiest eater will be able to enjoy a meal at Disney Springs®. Ready to shop until you drop? 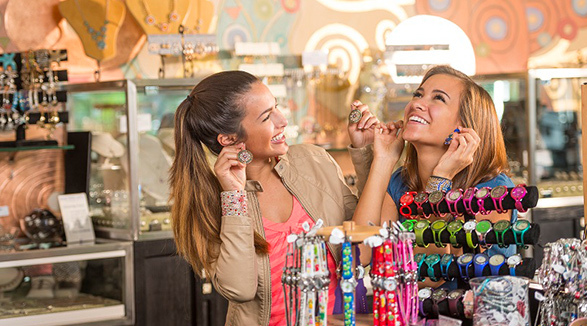 You can do just that at Disney Springs®, since it houses more than 100 shops and boutiques. Choices range from Disney favorites like the Bibbidi Bobbidi Boutique and World of Disney to fashion favorites like Vera Bradley and Anthropologie. You won’t find just clothes and Disney souvenirs here either. With so many stores, you’ll also find health products, fine art, housewares and more in the outdoor complex. It’s every shopper’s dream! 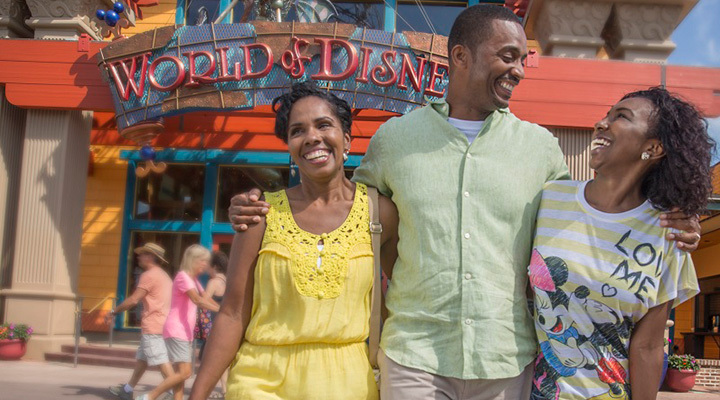 There’s more to Disney Springs® than just eating and shopping. The venue also offers attractions and entertainment for all ages. Your family can fly high above the ground on the Aerophile or even tour Lake Buena Vista in an amphicar. There are also plenty of opportunities to dance the night away, with live music on nearly every corner. You can even spend the night bowling at Splitsville Luxury Lanes. It’s easy to see why Disney Springs® continues to expand. The immense outdoor district offers good food, unique finds and outright fun for everyone. Whether you choose to spend a morning, afternoon, evening or even whole day here, we know you’ll enjoy all there is to do at Disney Springs®. 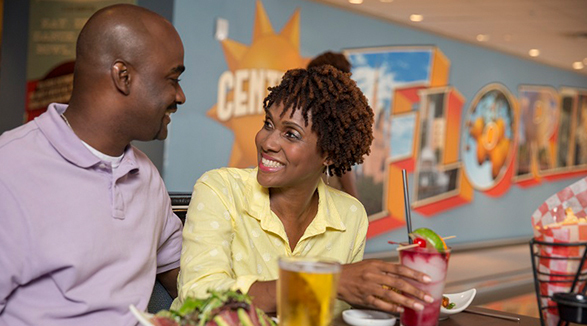 With the entertainment at Disney Springs®, you can dance, bowl or even fly the night away. There's so much to do, you'll want to come back again and again. Shopping at Disney Springs® is an adventure all its own. Check out our master list to see all of the fun shopping at Disney Springs® that awaits. The only thing disappointing about dining at Disney Springs® is that you won't be able to try it all! Check out our master list to narrow it down.